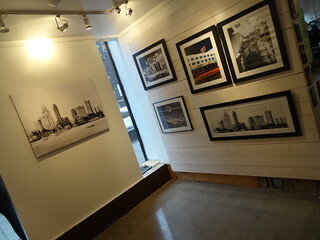 Detroit has suddenly become tour-riffic; you can see the city on foot, bicycle, bus, boat or Segway. 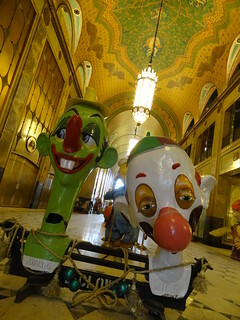 You can learn about history, architecture, where to eat or have a cocktail, you can even go behind the scenes… Today we are touring “Detroit’s largest art object” otherwise known as the Fisher Building. 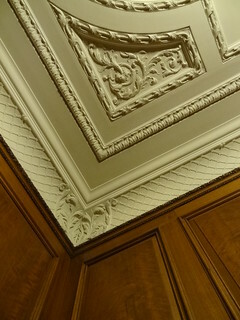 Built in 1928, designed by (all together now….) 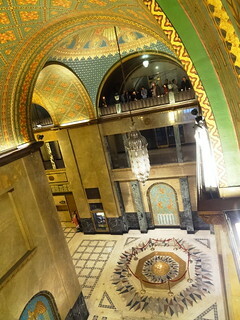 Albert Kahn, paid for by the Fisher brothers as a gift to the city, the building is an Art Deco masterpiece. First some stats: The building stands 28 stories tall on W Grand Blvd, it has two 11-story wings, 641 bronze elevator doors and 1,275 miles of electrical and telephone wire. It was built in 15 months by Michigan contractors and workers. 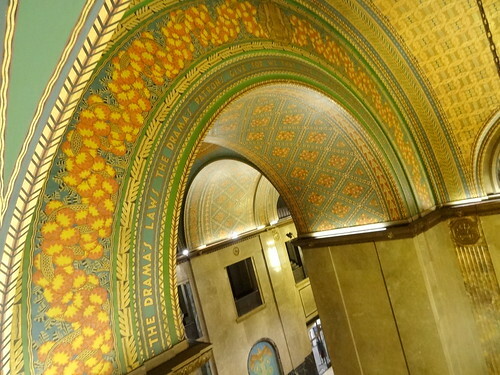 Pure Detroit is hosting their free weekly tour, we meet our guide Ryan in the lobby, 3-stories tall with a barrel-vaulted hand-painted ceiling, it is breath-taking. 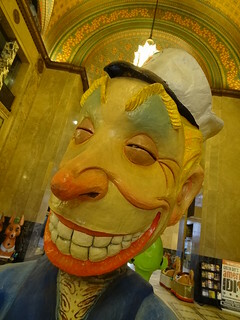 Today, in a special exhibit, a group of giant paper mache heads are scattered about the main floor vying for our attention. 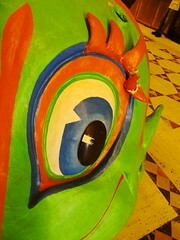 On loan from The Parade Company, they were originally created by artists in Viareggio Italy, some date back to the 1940’s. 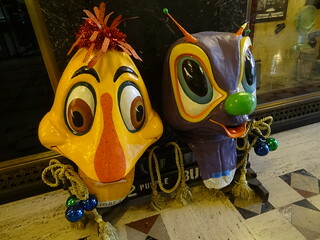 Two clown heads greet us first, painted cartoon style, the colors are bright and glossy. 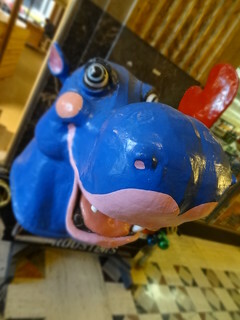 Continuing on we meet a pair of reindeer, an alligator and a blue hippo, a purple bug and a bumble bee are super cute. 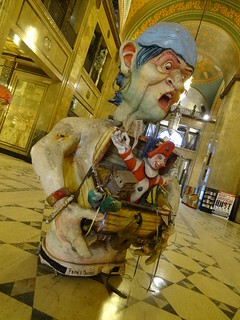 Further on we come face to face with the Pirates of the Big Head collection, finely detailed, they sport tattoos, gold earrings and a treasure chest. I can see the old Italian newsprint in areas where the paint has chipped away. 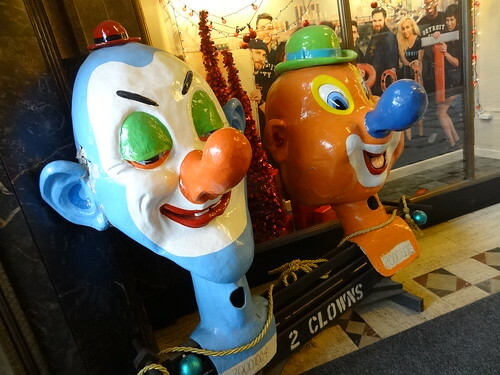 Many are in need of restoration, the exhibit hopes to encourage individuals to ‘adopt’ a big head, making donations to support the cost of restoration. 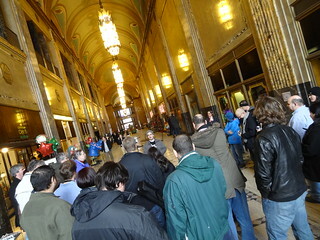 The tour moves onward down the long corridor, we learn the building is constructed of Minnesota granite and Maryland marble. The original theater entrance lobby with it’s fluted marble pillars is stunning; in total, 40 varieties of marble from all of the world line the interior of the building. 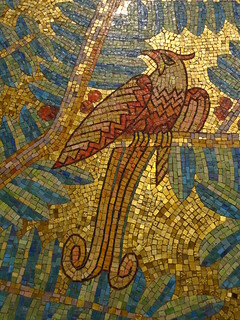 Near the Grand Blvd entrance, three original mosaics created by Geza Morati are as beautiful as the day they were completed, a brass piece in the floor is roped off, saving it from the wear of foot traffic. On the third floor we marvel at the frescos covering the ceiling; flora, fauna, hemlock, muses and red-haired cherubs were designed by Geza Maroti and painted by Antonio and Tomas de Lorenzo, at this level we can actually touch the arches, chandeliers seem only an arms length away. Ryan tells us the back in the day the ceiling was washed with buttermilk. He goes on to explain the symbolism of the eagles, the inclusion of commerce, transportation, art, agriculture and how the building reflected the new purely American style. 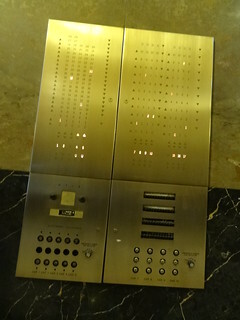 A single elevator leads to the 26th floor, we must divide into groups as the elevator cannot take everyone at once. 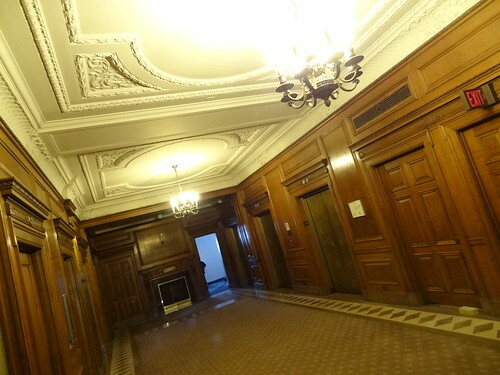 The doors open, we find ourselves in the Reception Room; back in the day floors 25-27 had a dining room, kitchen, living room and private elevator as this is where the Fisher brothers had their offices. At one time Persian rugs and massive hand-carved desks rested on the floor, very masculine. Dark walnut paneling, scrolled plaster ceiling, a fireplace and bronze chandeliers remain, I can’t say the same for the rest of the floor. 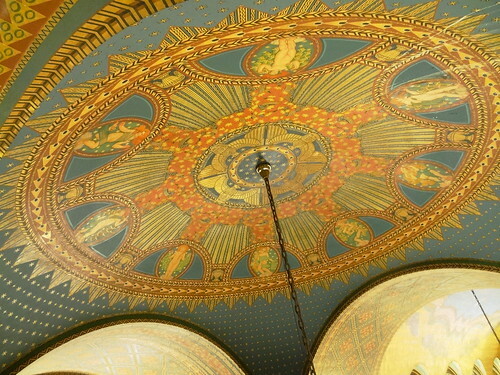 Drop ceilings cap off empty rooms, but then there’s 360 degree view of the Detroit skyline. As we move from window to window taking in the sights Ryan tells us the Fisher building was originally topped with gold-leaf faced tile. During WWII it was feared the glimmering tower would become a target for bombings, it was covered with an asphalt material; after the war, the tower was covered with green terracotta tile as you see today. 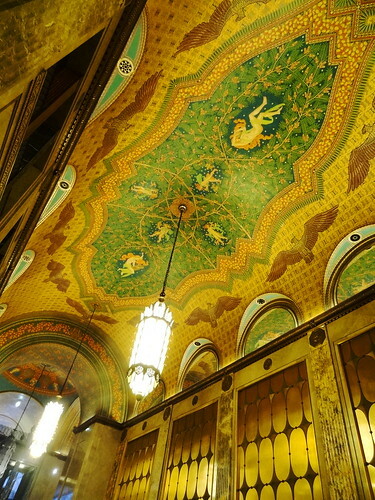 The Fisher family sold the building in 1962, in 2001 the Farbman Group of Southfield purchased the structure, an interesting bit of info: David Farbman, President and CEO of the Farbman Group has a family connection to the Fisher, Albert Kahn was his Great-Grand Uncle! 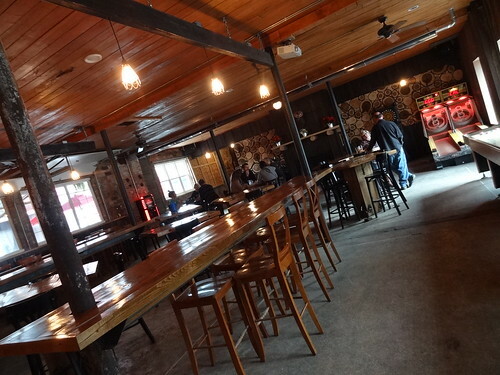 The tour ends, back on the main floor we stop in at Stella Cafe for a cup of coffee. 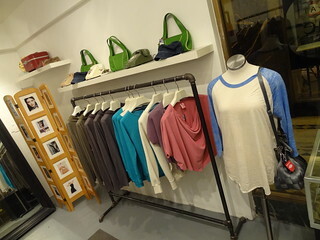 Recently remodeled using reclaimed wood the shop is bright and pleasant. 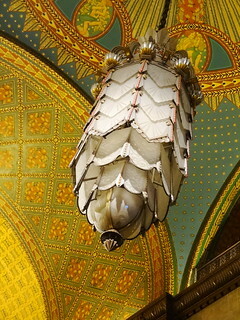 A series of 3 yellow lamps dangle above the counter, the same marble floor graces the space. 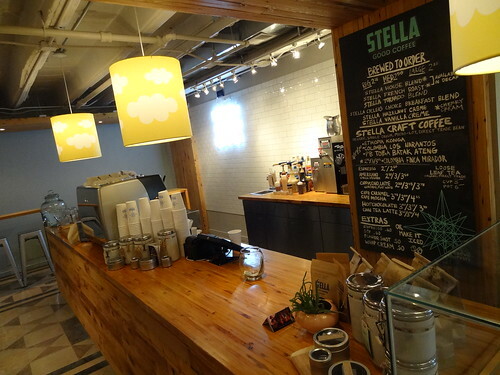 Stella roasts their own coffee beans, in addition they offer a selection of teas, juices, sweets, yogurt, soup and sandwiches. We drink our coffee surrounded by the beauty of the building. 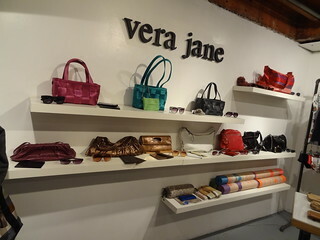 Vera Jane is just around the corner, offering a unique selection of handbags, lingerie, clothing and accessories, I like to stop in anytime we are in the building. 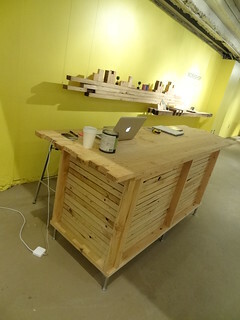 Workshop is the latest retail addition, the shop sells handmade furniture created from Detroit reclaimed lumber. Vacant houses are disassembled, the wood is removed, sanded and refinished, James Willer of Reclaim Detroit and Kevin Borsay of Pure Detroit, then create furniture from the pieces. 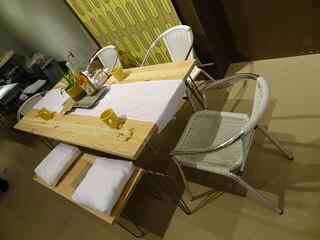 On display are dining tables, benches, shelving and coffee tables; each piece comes with the address of the house the wood came from, cool. 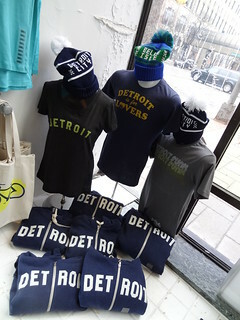 I also love the wallpaper which comes from The Detroit Wallpaper Co.
We stop in at Pure Detroit to say thanks for the tour, referred to as “The Store of All Things Detroit”, husband and wife team Kevin and Shawn were the first to create a totally Detroit-centric shop. 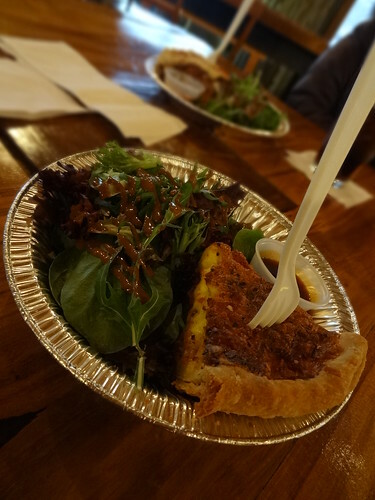 Through the years they have grown from a single store to three, each in a landmark building, and have added Stella and Rowland Cafe to the family.Their passion for the city is obvious in everything they do. 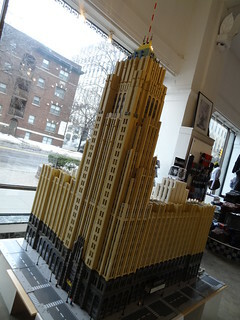 We wander among all of the clothing, books, art, Pewabic Pottery and snacks, near the counter is an awesome model of the Fisher built from Legos, groovy! 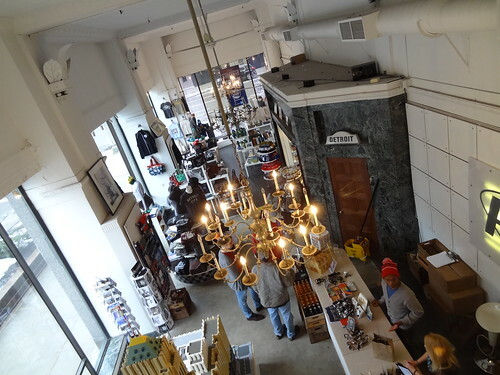 Kris purchases a hat and we are off…..
← Grand Rapids: Check it out ! Awesome! 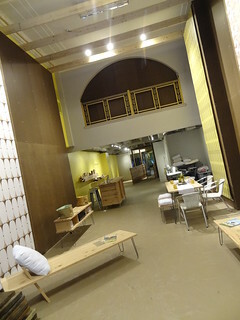 I went to a conference that was sponsored by Reclaim Detroit a couple of years ago about Deconstruction and reuse. Have been very interested ever since! 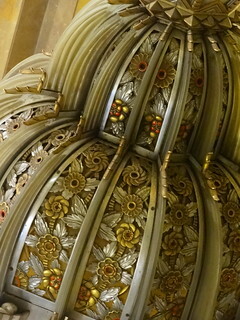 I worked in the Fisher Building for eight years and every day I found some beautiful detail to admire. What a joy it was to enter that building every single day.